The Beauceron is an extremely intelligent dog. It can execute any task and is one of the most obedient breeds that is available today. They are a very brave breed and can be calm in situations where other dogs may be hyper. They make very good guard dogs, as they like to protect their owners, their family, and their homes. Their loyalty is above average and its constantly trying to win the affections of its family. If this dog is not trained properly, it has the ability to actually run the owner instead of the owner running the dog. They are very good with children but may try to herd them due to their instincts so they should always be supervised. They are a bit hesitant when meeting strangers and so not like to meet dogs that they do not know. 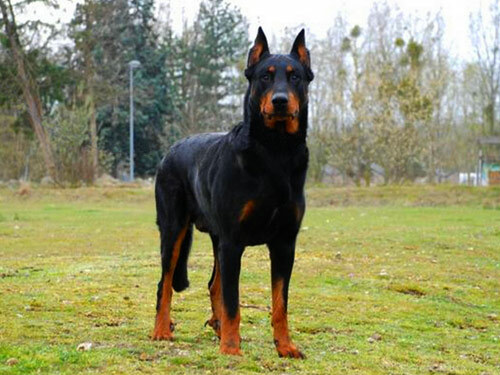 However, if you have other dogs or pets in the home, the Beauceron will get along with them. This breed has a need to be physically and mentally exercised on a daily basis. Because the breed is so intelligent, its mind needs stimulation. If it doesn’t receive stimulation, it can become disruptive. They require lots of exercise, much more than a simple walk through the park. It needs to be intense, strenuous exercise. If you do not have the time or energy to commit to giving the dog this type of exercise, the Beauceron may not be the right breed for you. It’s coat is rather short and does not require much maintenance. As for health issues, there are really no major health concerns that surround this breed in particular. Chronic Hip Dysplasia and gastric torsion are the most seen concerns and both are fairly minor if caught and treated. The main thing to remember is that if you notice your dog showing any signs of pain or discomfort, then it should be taken to your local vet immediately to ensure that it is healthy, or to treat it if it is not. If you take good care of your dog, than it can live between 10-12 years. The Beauceron is a French dog breed that dates as far back as the 1500s. It is one of the oldest dog breeds that is on record to date. Its original roots are planted in Paris and was initially used as a farm dog. It herded sheep, and protected them as well. It also did the same for cattle, and its family. The breed came in a long coated and a short coated version. The first Beauceron was recorded in 1893, and in 1922 the first breed club was formed in honor of the breed. The French also used this breed as messenger dogs during both World Wars. It worked along the front lines and had a wonderful ability to follow instructions. It also had a keen sense when it came to following trails as well. The breed was admitted into the AKC in 2001, under the Miscellaneous class. Their excellent obedience, tracking, and agility are making them very popular.